Over the past two weeks, I have been host to visitors - twice. My first guests were my former student, Emily, and her fiancé, Alex. 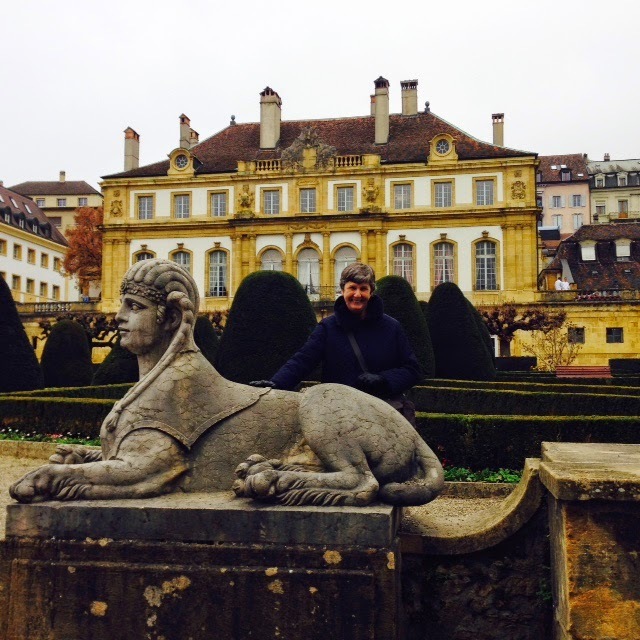 I discovered some time ago that Emily would be coming to Neuchâtel for a conference so I suggested that she and Alex might want to stay with me. As it worked out, their time here coincided with my trip to Düsseldorf for NESDA, so although they were here for five days, I only saw then twice over two evenings. 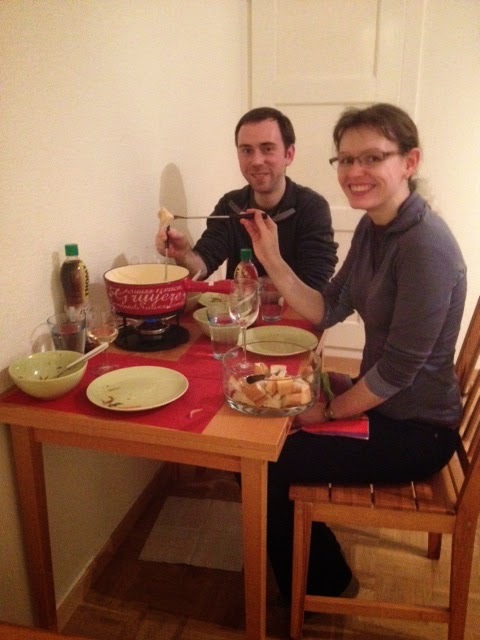 Alex and Emily sample my first fondue. I am pleased to say it was a success. Nevertheless, we enjoyed catching up with each other and I benefited from their presence in the apartment. Alex discovered that a router near the TV was merely an energy waster so that is now disconnected, and both he and Emily took care of some laundry for me while I was away. I think they left more food for me than I had before they arrived. They were wonderful guests. Less than a week later, Margaret arrived for a longer stay. When I had suggested to friends back home that I would be interested in European Christmas markets, Margaret said she would love to join me in discovering what they were all about. Back in August, we planned two weekends of travel around these events. These would be my first weekends of independent travel since Bob left. 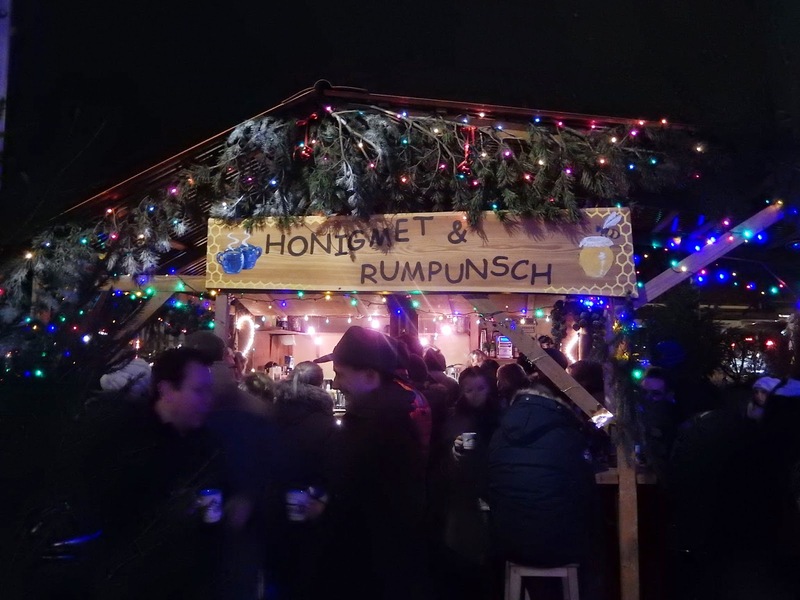 Our first excursion took us to Konstanz, Germany, a town on the Swiss border which is a popular summer resort, but at this time of year draws tourists to its Christmas market. 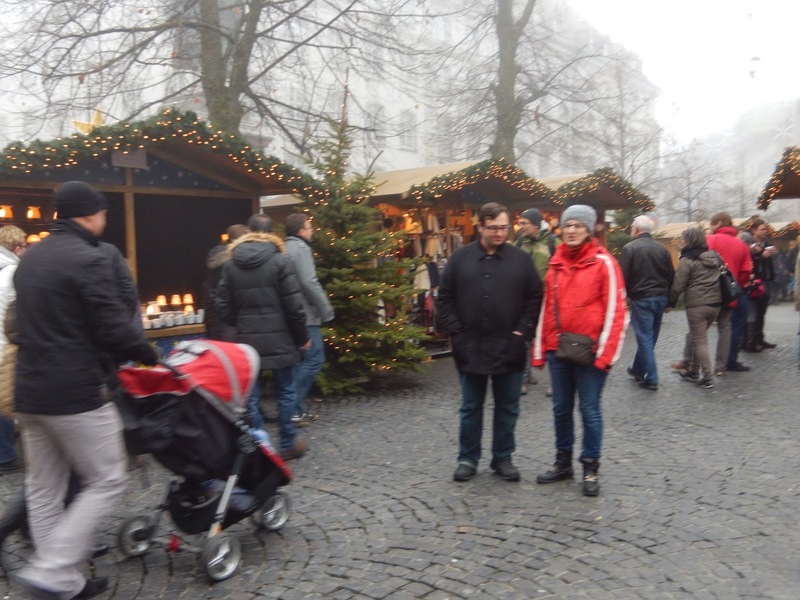 Since we arrived at around noon on a Saturday, we decided to explore the Altstadt (Old Town) first. 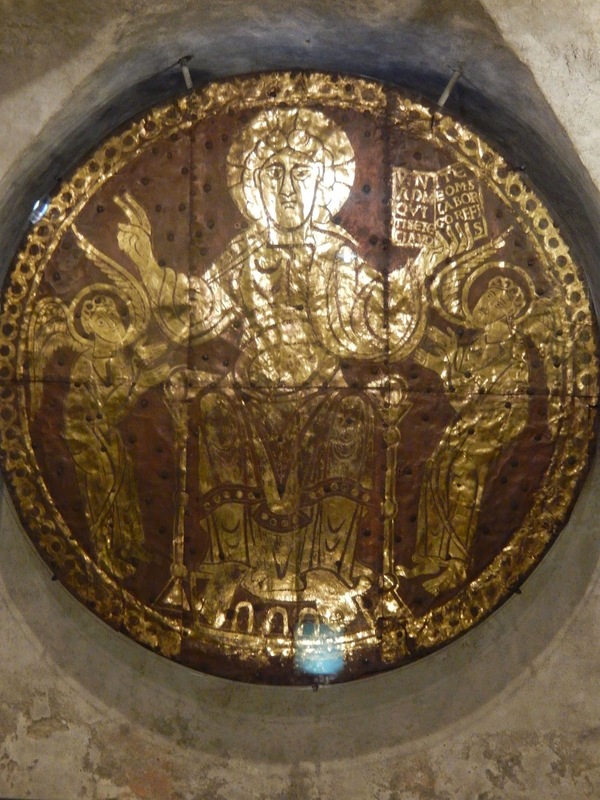 We were pleased to discover that the local Cathedral, Muenster Unserer Lieben Frau, had some very unique features, including a filigree representation of the Holy Sepulchre in the St Maurice Rotunda, and, in the vault, three golden discs which are very old. Nearby, we had a delicious lunch of beef goulash at a small restaurant in the Cathedral square. The soup was so good, I was tempted to ask for the recipe. 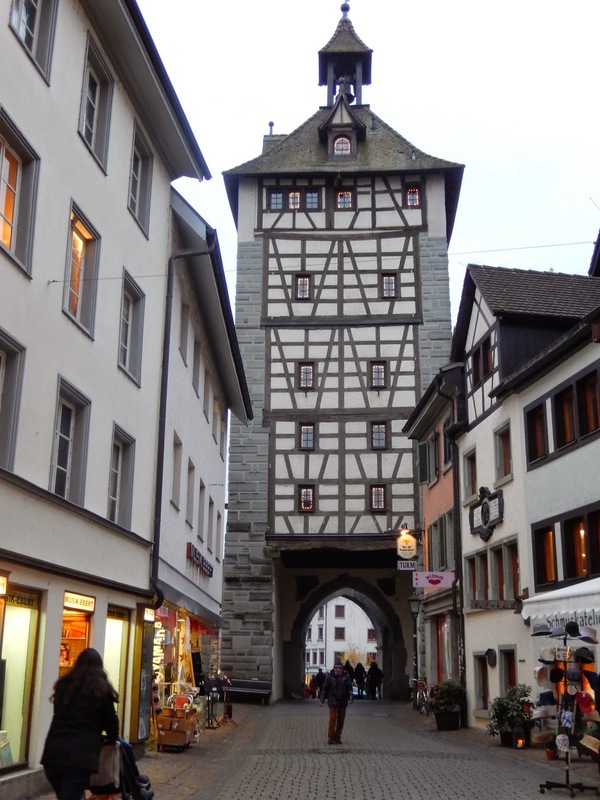 As we explored the old town, we saw Roman ruins, a gate/tower into the town and many charming buildings and shops. 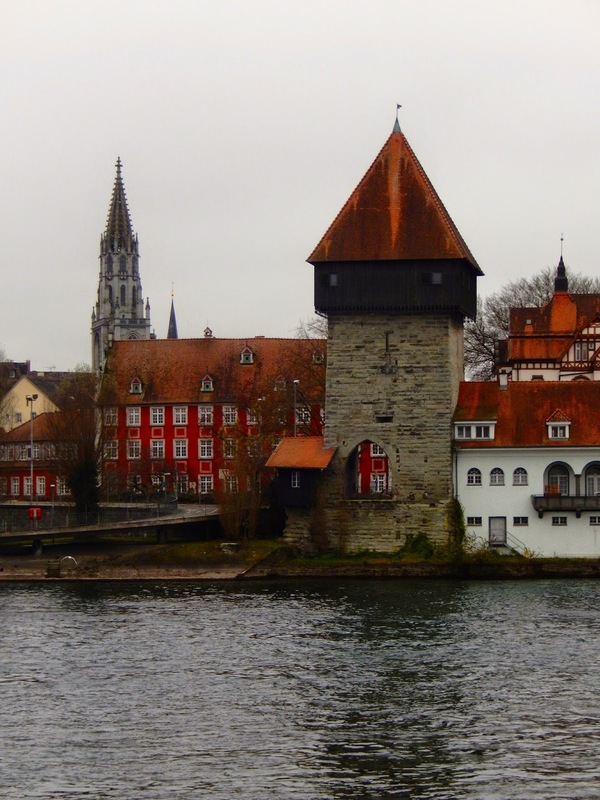 Konstanz is a magnet for Swiss shoppers, since crossing the border is very easy here, and German prices are more reasonable than Swiss ones. Eventually, we arrived at the market, the main reason for our visit. Margaret was good at finding "superior" booths which offered unusual gifts for the Christmas shopper. We also enjoyed some warm beverages that evening, a rum punch for Margaret, and a honey wine for me. These were served in china mugs for which we paid extra and then were refunded the cost when we returned them. We probably should have kept them as souvenirs. Warm drinks add to the festivities. Sugar and cinnamon adorns our homemade waffles. They were sold to us by two guys in a tiny booth. We lined up for quite a while to get these. After dinner at a German restaurant in town, we returned to the market for a final look at the merchandise. 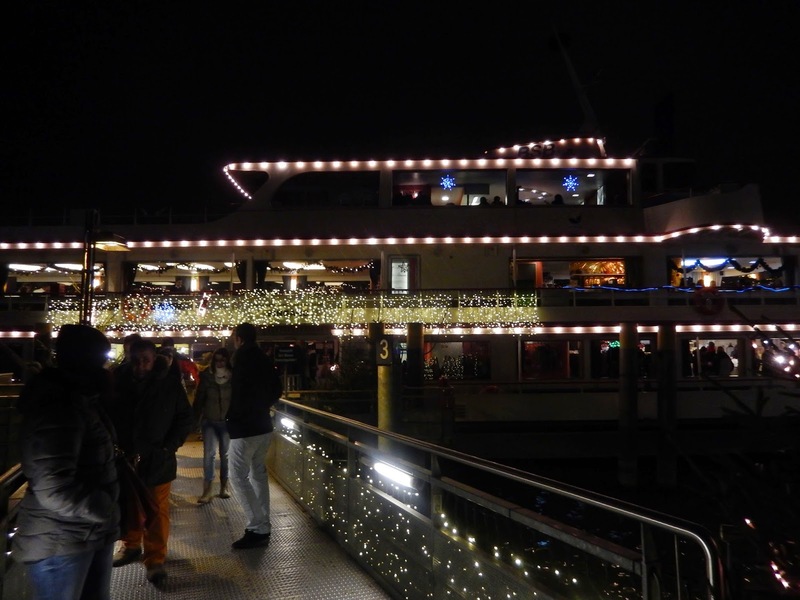 We made a point to visit the Christmas ship, anchored in the Bodensee (also known as Lake Constance), a special feature here. 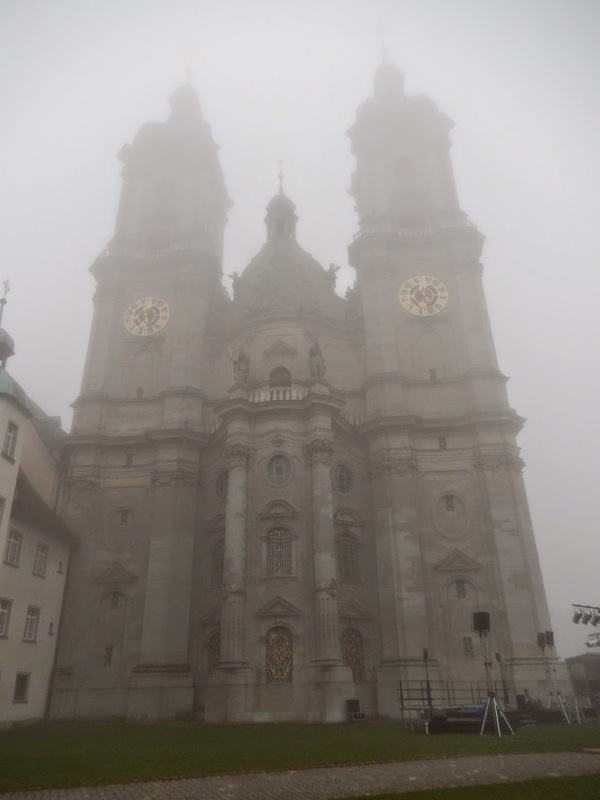 The next morning, we made our way by train to Saint Gallen in Switzerland. This town had first entered my imagination through my many readings of Robertson Davies' Fifth Business since the tale is supposedly penned there. 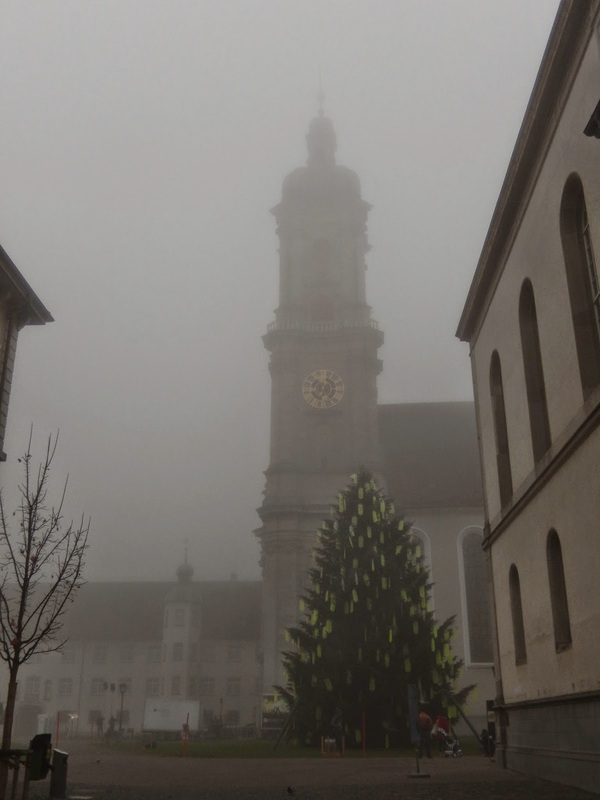 Saint Gallen was very foggy all day, which made it hard to see the place clearly, but we were very glad we made a stop there. At one time, it was a very important centre where Prince Abbots created a principality around the monastery. Today, the grounds are a UNESCO world heritage site. 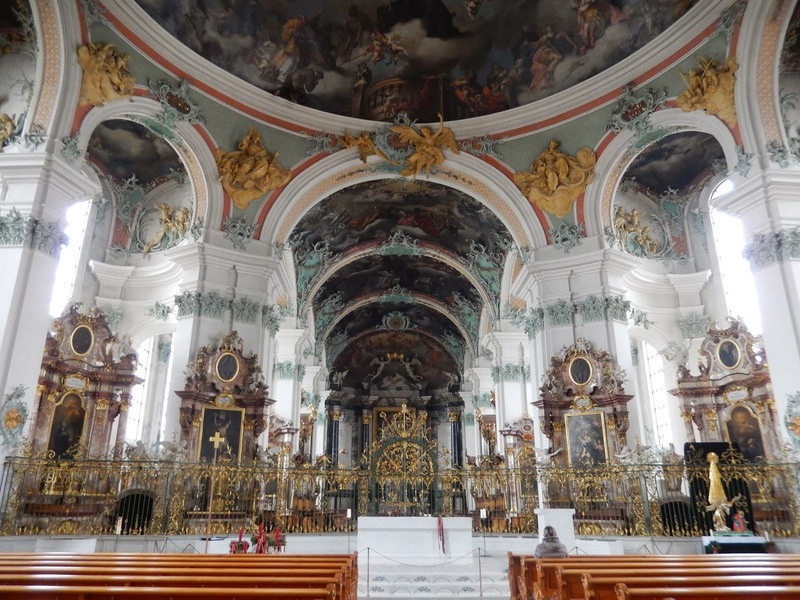 The Cathedral on the site of the Abbey of Saint Gall is a masterpiece of late Baroque architecture. It is very beautiful and very uplifting. Once I entered it, I was reluctant to leave. The ceilings are painted with lovely images, and much of the rest of the interior is white or golden. 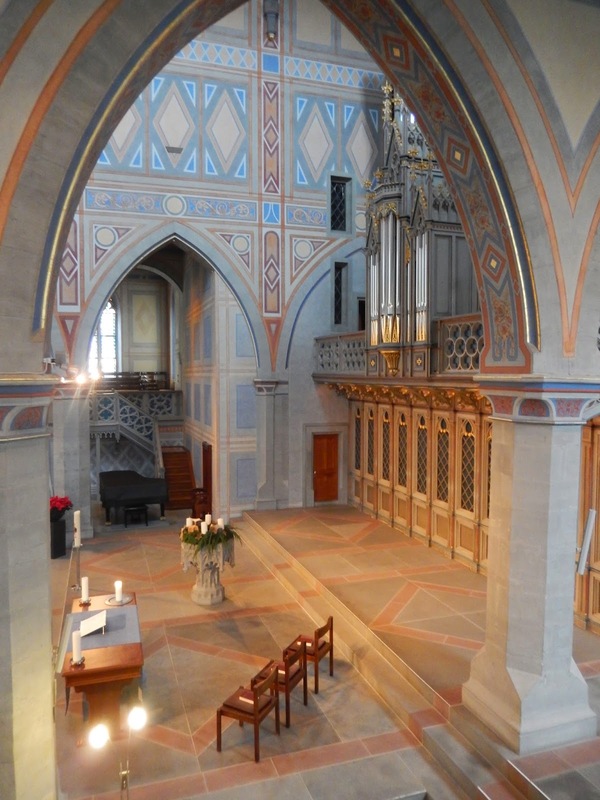 The lines are very graceful too, another element adding to the church's majesty. 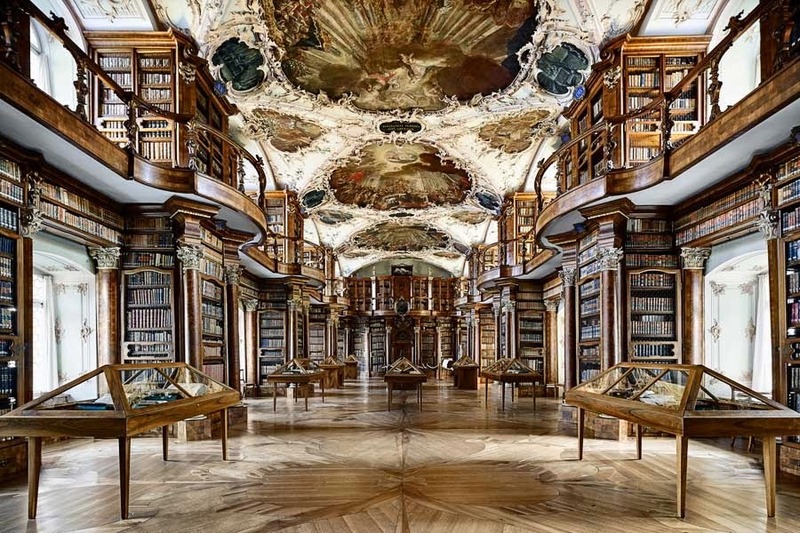 Even more remarkable is the Abbey Library of Saint Gall. We were very fortunate to have seen it, since it had been closed for several weeks and only opened at 13:00 the day we visited. To protect its wooden floors, visitors must wear slippers over their shoes. Photographs are not allowed, so I have borrowed one from Trip Advisor to show you this very special place. Besides its awe-inspiring beauty, this library is a treasure trove of rare books and valuable artifacts. 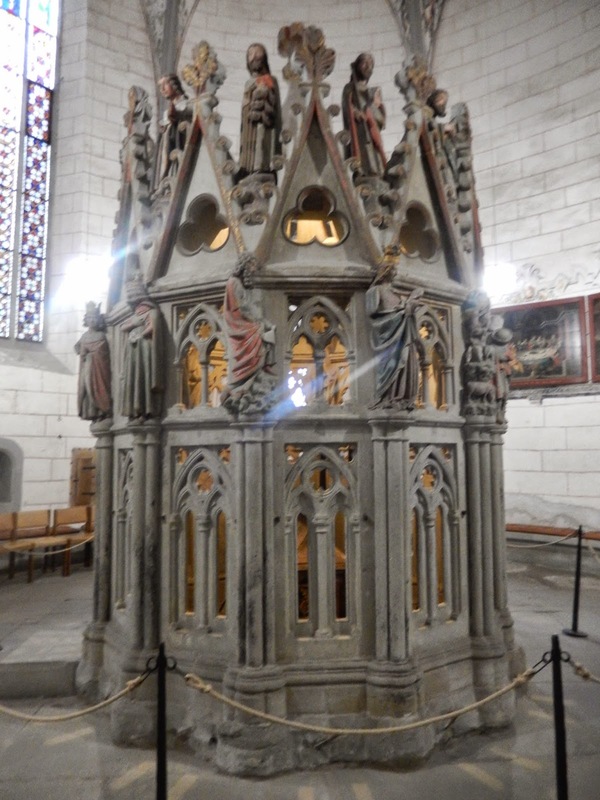 I was impressed that an ivory insert from Charlemagne's Bible was on display there; Margaret, always the librarian, was in heaven in this place, as she studied the classification system used and read the spines of many of the books in the collection. 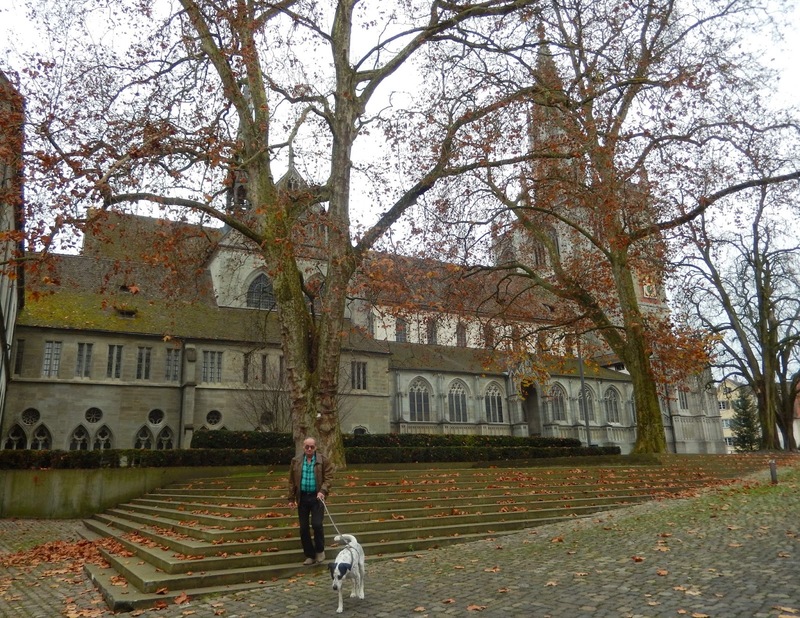 Just outside the abbey grounds, we stopped at another church, this one a Protestant one. It, too, was delightful, very colourful. 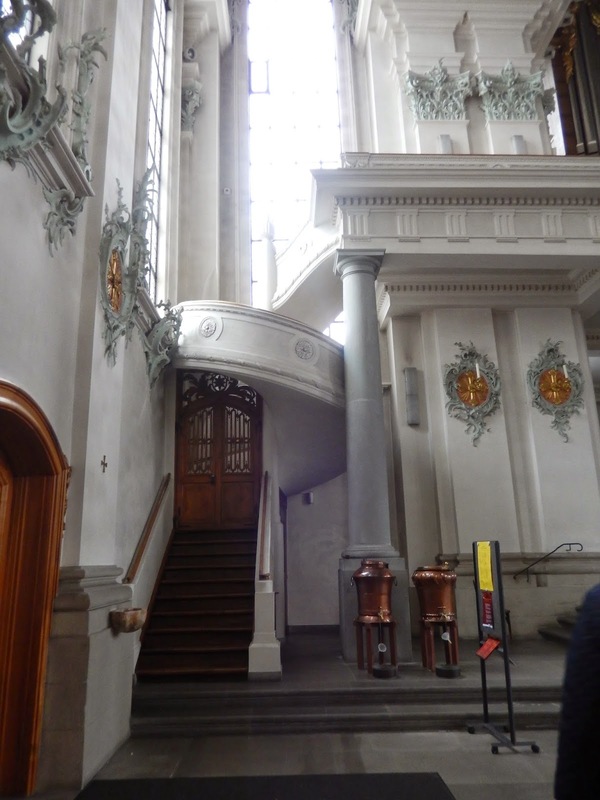 I often wonder what Europe would be without its churches. They certainly are very pleasing to me. 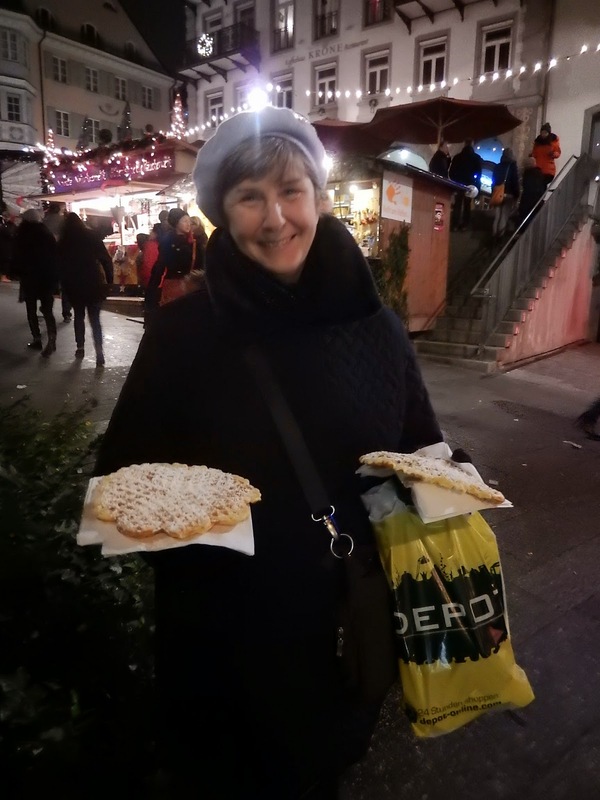 Finally, we wandered through the Saint Gallen Christmas Market, much smaller than the one in Konstanz, where we bought cake to take back to our friends in Neuchâtel. We were on the train before four and back home before dinner.